The 2014 Olympia will be a contest for the ages. Read who we think will come out on top! Winning the prestigious title of Mr. Olympia is no easy feat. Hundreds of top professional bodybuilders have vied for Olympia success, but only 13 Mr. Olympias have been crowned since its inception 50 years ago. Despite those odds, the event inspires droves of elite iron warriors to step onto one of the biggest stages of their lives. The 2014 Olympia—being held in Las Vegas for the 16th year in a row—will host plenty of top-tier talent combined with fresh faces that wish to break through to the coveted top six. The big question for this year&apos;s Olympia is whether three-time champ Phil Heath can maintain his winning streak, or if his bodybuilding nemesis, Kai Greene, will filch the title from the Sandow incumbent. So far, most bets have been on Heath taking home his fourth title, but in what is probably the most stacked and competitive Olympia of all time I have a feeling a new champion will be crowned. Aside from the obvious threat posed by Kai Greene, there is Mamdouh Elssbiay (aka Big Ramy), Dennis Wolf, Shawn Rhoden, and Dexter Jackson. Every one of these behemoths continue to up their game with each Olympia outing. The top 10 at the Olympia is a prestigious group, but moving into the top six is a different challenge altogether. William Bonac is the one relative newcomer who has the potential and credentials to crack the elite Olympia top six. He already has some impressive notes on his pro resume. He has fallen within the top six in all but one of his eight pro outings. The 2014 Golden State Pro winner and Australian Pro Grand Prix runner up possesses that rare combination of full, round muscle and spectacular shape. With no weaknesses and copious amounts of thick, shredded muscle evenly distributed across his compact frame, the Ghana native is ready to do some serious damage in bodybuilding&apos;s highest ranks. However, this is his first Olympia. He may not have the experience needed to unseat his wily competition. Tenth place appears likely. Maintaining a pro bodybuilding career with more ups and downs than a barbell takes a certain level of determination. Throughout his 13-year pro career, Victor Martinez has amazingly continued to grow as a bodybuilder, in spite of injuries and legal woes. Despite a disappointing 13th-place finish at last year&apos;s Olympia, Martinez presented phenomenal development at the Arnold Classic earlier this year and was justly rewarded with 4th place. 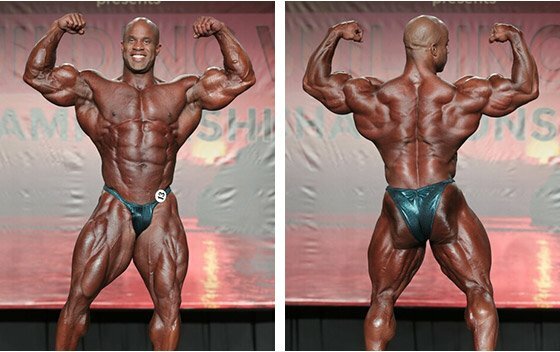 At IFBB PBW Tampa Pro, he seemed more streamlined than ever and won decisively. Although Martinez might not be at his prime, he is still a fan favorite and a worthy Olympian. Branch Warren still possesses the "freak factor" and tree-trunk legs that have made him a household name in bodybuilding circles. His recent 2014 Europa Dallas win is proof he&apos;s still a force to be reckoned with. Despite incurring his share of injuries, Branch has competed every year of his pro career, and still managed to snag Olympia success. Branch came close to winning the Olympia in 2009, narrowly conceding the title to Jay Cutler. It would be tough for the battle-hardened veteran to win Olympia this year, but he has what it takes to at least place in the top ten. Netherlands native Roelly Winklaar is a mainstay in the top six of many contests he&apos;s competed in. 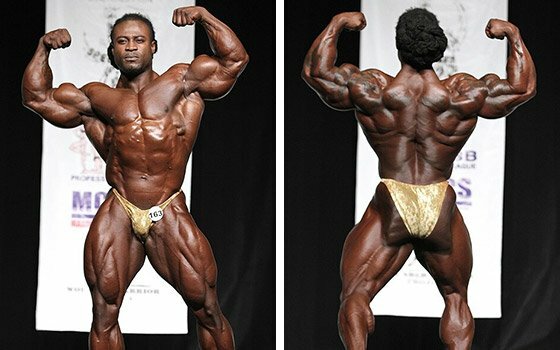 Having won four pro shows, the massive Winklaar is difficult to overlook in any line-up. Perhaps not the most aesthetically-pleasing pro on today&apos;s circuit, Winklaar more than compensates with his impressively thick, dense muscularity. When he brings the kind of conditioning that wins shows, he&apos;s hard to bet against. At last year&apos;s Olympia, he showed up with a career-best look and claimed 7th place against the world&apos;s top bodybuilders. Winklaar is expected to put on another good showing at the 2014 Olympia. Dexter Jackson is known for possessing a perfect combination of full, round muscle, super-shredded conditioning, and impressive aesthetics. Throughout his pro career, Jackson has earned 18 big wins, including four Arnold Classic victories and the Mr. Olympia title in 2008. Jackson is also known for his consistency: He brings virtually the same winning physique for each competitive outing. Many have speculated that the 15-year pro veteran must be due for retirement soon. However, recent photos of the 44-year-old contender show that "The Blade" is far from finished. Coming off an excellent 2013, Jackson is poised to place strongly in the mix at this year&apos;s Olympia. With an IFBB pro record of two wins and one loss, as well as having a physique that looks permanently Photoshopped, Mamdouh Elssbiay—aka Big Ramy—is one pro many feel will win the Olympia sooner rather than later. With the possible exception of his calves—which may only appear small because they&apos;re dwarfed by the largest quads in Olympia history—Big Ramy appears to have no weaknesses. Plus, he possesses the largest assembly of muscles of any current pro. Should he present the ultra-shredded, grainy look that has so far eluded him, his immense muscularity should place him in the top six. Shawn Rhoden has quite a high placement pedigree. He clinched 3rd and 4th at the 2012 and 2013 Olympias, placed 2nd at this year&apos;s Arnold Classic, and won the 2014 Australian Pro Grand Prix. Stacked from head to toe with dense muscularity, Rhoden is always on point with his conditioning and possesses one of the most impressive V-tapers seen on any IFBB pro stage. Rhoden will undoubtedly continue to sharpen his tools as he edges closer to Olympia glory. Rhoden is a legitimate candidate for the top six, and should be very tough to beat. Dennis Wolf has placed in the top seven at 23 of his 25 pro shows since debuting at the Europa Supershow in 2006. Among the largest pros on today&apos;s scene, Wolf has finally found the perfect formula to give him that additional edge necessary to win big titles. Wolf came close to fulfilling his dream of capturing Olympia gold in 2013, and secured a solid win at the Arnold Classic earlier this year. The man known for his monstrous width will now be gunning for the top-two ranked contenders: Kai Greene and Phil Heath, both of whom will need to bring career-best physiques to keep Wolf from finally breaking through. Who can stop this man? Current Olympia champ Phil Heath is considered by many to have the most impressive physique ever to grace an Olympia stage. This three-time, back-to-back Olympia victor has made no secret of his intention to secure win number four. With no weaknesses and a phenomenal size for his 5-foot-9 frame, he is expected to steadfastly man his battle station. However, if Heath is even slightly off his game, another competitor could usurp bodybuilding&apos;s current king. The legendary Kai Greene is always in contention for an Olympia win. With superior back and leg development, as well as a side chest shot that can&apos;t be touched, Greene&apos;s only limitation appears to be his conditioning. 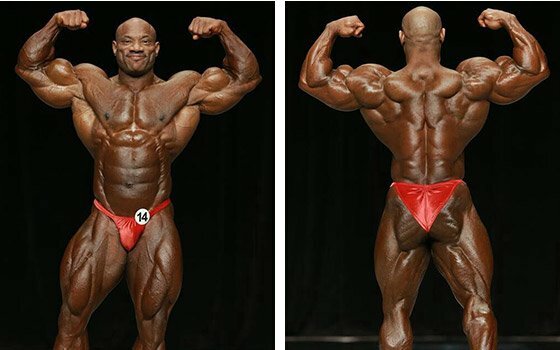 Though supremely on point for most of his outings, Kai has not yet captured that grainy, hard look that Heath has so magnificently displayed for each of his Olympia wins. Wider, rounder, and more muscular than Heath, Greene also possesses great proportion and symmetry. Few would have argued against his winning the title in 2013, but can he bring that extra detail needed to beat Heath in 2014? Clearly, the 2014 Olympia will have no shortage of stellar athletes. With contenders like the Wolf, the Predator, and the Gift vying for ultimate honors, this year&apos;s Olympia top ten will light up the Las Vegas stage with the world&apos;s best physiques. Will it be a closely fought battle? Will there be any surprise decisions? Any controversies? To find out as events unfold, witness this historic contest live or watch it on the Bodybuilding.com webcast. At the 49th Mr. Olympia, it was Phil and Kai to the bitter end in front of the biggest crowd ever. And like the last two years, Phil came out on top! Mark Anthony On The Mark! It wasn&apos;t an easy choice, but the judges gave the Men&apos;s Physique Showdown trophy to Mark Anthony Wingson. At the inaugural event, he stood apart from a talented field!